I'm not wedding professional ... yet. 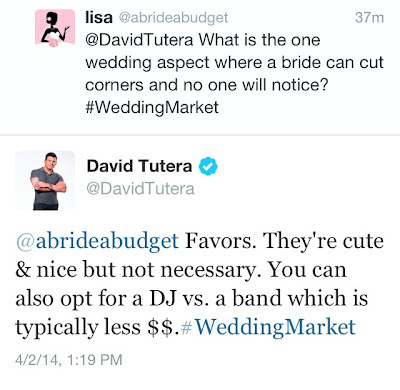 My ideal dream job is to be a wedding planner, but I have to get through my own wedding first. And in order to do that, I have to make the right decisions along the way. But this is my first trip to the rodeo, as they say. So anytime there's a chance to chat with a professional -- for free -- I seize that opportunity. Like when BRIDES magazine had Peter Callahan on their Facebook chat and I asked him about wedding catering (since he is a caterer). I was hoping he would say something like "limo" since that's still on my "to pay for" list. I actually have gotten a ton of feedback that says the same about favors. They're cute but not really needed, so says everyone. You don't need to give your guests a "thank you for coming to my wedding" gift, especially since you are paying upwards of $100 for their dinner, plus the extras (like a welcome bag). Personally, I love our wedding favors and since my mom DIY'd them, they ended up costing only $1.50 each. That's definitely budget friendly. And I just love favors in general. Honestly, I think you have to give them out at weddings. I'm a stickler for that. So I wasn't too crazy about that suggestion (if you need a wedding favors suggestion, though, check out our post: 100 Wedding Favors Your Guests Will Actually Take). 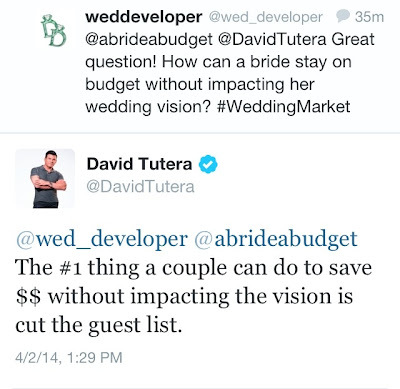 After I asked my question, someone replied to it and I was attached, so I got to see that question and answer too (and since it pertains to budget, it fits A Bride On A Budget's vision too). That is so very true. Our reception is about $150 a head, so if we can even cross two couples off the list, that's a savings of $600. And we aren't haphazardly giving out "plus ones" either. At the price we're paying, we really had to trim the list ... and I think we did a great job with that. If you don't feel like you can trim it, have an A list and a B list. Just make sure the B listers, if you find room for them, have enough time to reply. I hate when B listers receive a wedding invitation with an RSVP by date that has passed. There's nothing more tacky or that says, "You're a last minute invitee" than that. And finally, I wanted to ask him about Pinterest. It's a topic that we had at #BridalBabble a few weeks ago that was definitely one of the chattiest chats. 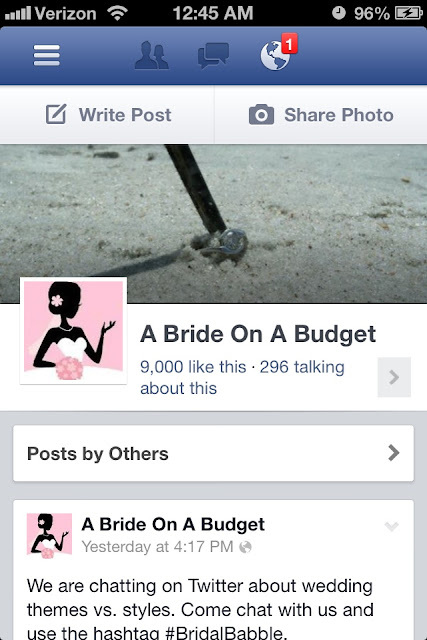 It was great to get ideas from the wedding professionals who attend the chat and from engaged brides. 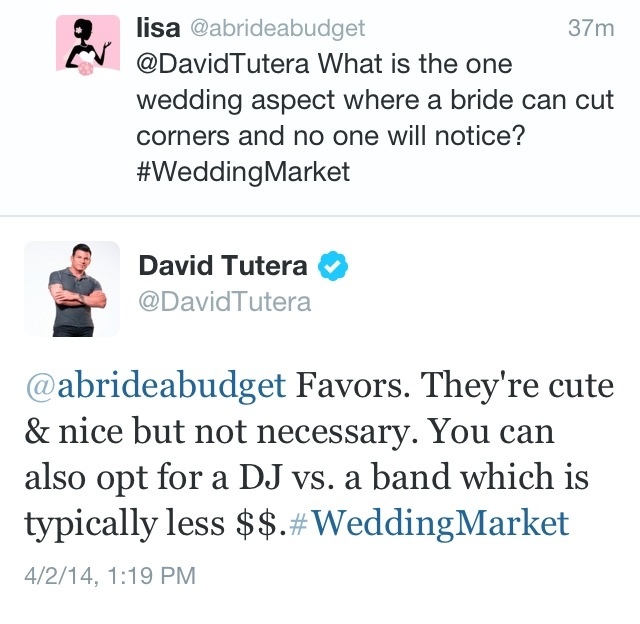 But I wanted to see what David Tutera thought because, I mean, he's David Tutera. I couldn't agree more. 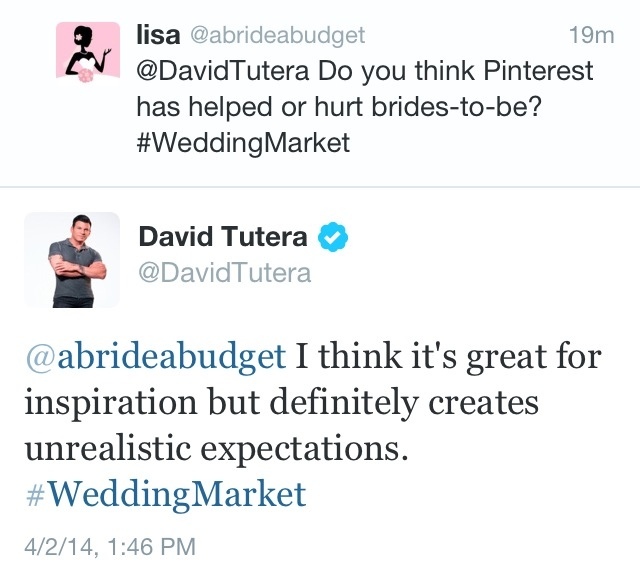 Actually, I did agree on my post about Pinterest. So a little free advice from the professional that I definitely agree with. Makes me feel like I'm on the right track. And, just a reminder to you: If you happen to see where a professional is answering questions for free (Facebook, Twitter, Snap Chat, etc. ), definitely jump on it. It's worth it for the advice and the peace of mind. 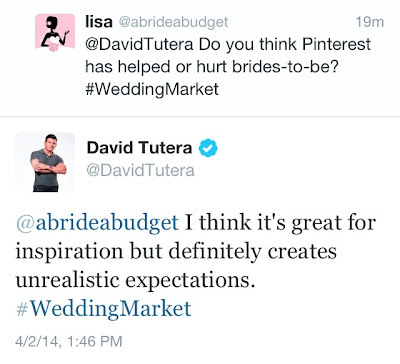 BRIDAL BABBLE: What do you wish you could ask David Tutera? This was great! Thanks! I think for me the hardest thing is to cut down that guest list.